Race away from Starbucks – and fast! | What Would The Founders Think? Race away from Starbucks – and fast! As has been widely reported, Starbucks CEO Howard Schultz wants to talk about race relations. Actually, he doesn’t want to talk about it as much as he wants his employees to engage customers in the subject. There is really nothing I like better than discussing the subject of race with someone who is directed to do so by the corporate bosses. Of course, Starbucks is a pop culture icon. By “pop,” I mean pompous, obnoxious and pretentious. The introduction of its “Race Together” campaign certainly meets the “pop” definition. Who doesn’t want a lecture with their latte? 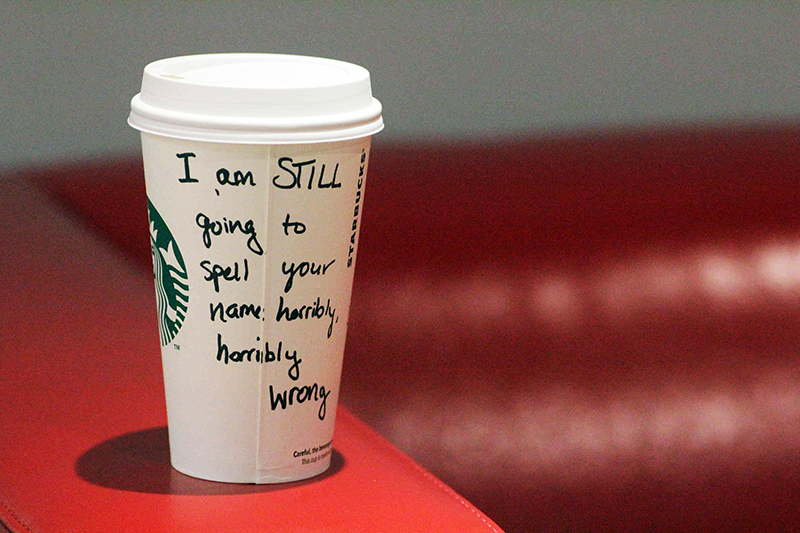 Under the “Race Together” campaign, Starbucks baristas were encouraged to write Race Together on customers’ cups. The campaign has not been received well by customers and others on social media. It hasn’t been well received by me either, as the experience below from last week suggests. The process of purchasing a beverage became much too complicated. The barista, Greg, said he was half black and also gay. Or, maybe he was black and half gay, I can’t really remember. Here is how the exchange went (sort of). Greg: What can we get you today? Me: A small caramel apple cider, please. Greg: What’s the matter, coffee is too “black” for you? Me: Huh? Did you just use your fingers to make quotation marks when you said black? Greg: Yes, I’m starting a conversation about race. Me: Why? I just want a caramel apple cider. Greg: Corporate initiative. We’ll have this whole race thing sorted out in no time. Me: I noticed you didn’t make the quotation mark gesture when you said race thing. Greg: Are you mocking me? Me: I’m not really interested in having this conversation; I really just want my drink. It really shouldn’t be this hard. Greg: Your drink will get done. I’ll write something on your cup too. Me (recalling that they rarely spell my name correctly): That’s really not necessary. Greg: It’s no problem. In fact, it’s required. Me: This is a bit of an ordeal. Getting a drink used to be much easier. Greg: Well, if you’d cooperate and engage in a conversation about race, things would go a lot smoother. Stop being so difficult. Greg: Are you projecting some of your white privilege? Me: Huh? Okay, I’ll play along, except I want to talk about the economic conditions in Venezuela. Shortages everywhere. What do think about that? Greg: Um, um. We’re talking about race here. Me: You’re talking about race, but I want to talk about something else. Have you seen those lines outside of Venezuelan markets? Just to buy basic stuff, like toilet paper. The lines are longer than at Starbucks. Greg: Our lines aren’t that long. Me: They will be if this conversation goes on much longer. Greg: Here is your caramel apple cider. They want us to write “Race Together” on the cups, but I wanted to be more creative. Me: It says, “Hands up, don’t shoop.” What’s shoop? Greg: It’s shoot! Hands up, don’t shoot! You know, Ferguson. Me: But is says shoop. It’s a P, not a T. See the loop at the top of the letter. Definitely, a P.
Greg: It’s a T, dammit! Marcus, come over here and read this. What does it say? Marcus (second barista): What is op? Marcus: It says, “Hands op, don’t shoop.” What’s op? Greg: It’s not op, it’s up! Op isn’t a word. I gently grabbed my misspelled cup from the counter and quietly made my exit. The two baristas were still discussing race…and spelling as I left. Since that episode, Starbuck baristas have been ordered to stop writing “Race Together” on cups. Presumably, they have returned to just misspelling customers’ names instead. And should you continue to partake in lattes or frappuccinos from Starbucks, ask for extra whipped cream, but tell them to hold the social justice. Rizatriptan disintegrating tablets may nexium without insurance contain phenylalanine.. I stopped patronizing companies whose policies are in direct opposition to my values. Starbucks resided in no man’s land until now. Frankly, their coffee tastes like burnt excrement anyway. I only used them for meetings anyway, for the most part. I do reserve the right to make the occasional morning deposit as I am out on my rounds. Perhaps a “race” to their plumbing.